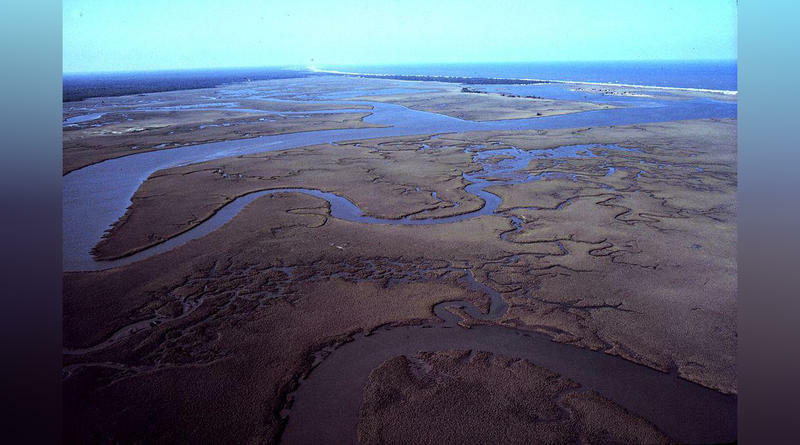 North Inlet - Winyah Bay National Estuarine Research Reserve. Aerial view of meandering tidal creeks and extensive pristine marshes in North Inlet Estuary. Vicinity of Georgetown, South Carolina. Geography Professor Kirsten Dow advises people who want to care for their planet to not only do individual acts of saving energy such as turning off unneeded lights, which cuts down on the burning of coal needed to generate that electricity – still 40 percent of South Carolina’s energy comes from coal- but to take their actions to work, and encourage their employers to use their purchasing power to do things like buy recyclable products and conserve energy on a larger scale than individuals can do. Her fellow geographer Dr. Greg Carbone echoes the sentiments of both Jones and Dow. If mitigating greenhouse gas emissions, or any other conservation issue, is considered too expensive by society or politicians, he says, how expensive will it be in the future if we don’t conserve now?